This year I got tired of wandering from one end of our property to the other only to realize I needed a pair of garden gloves and a tool or two that were back where I started. 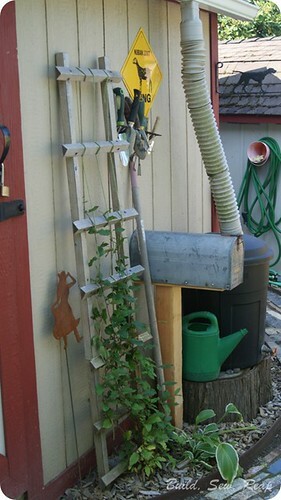 We have multiples of just about every handheld outdoor tool so I picked up a couple of old mail boxes from my local buy-nothing Facebook group and installed them where I needed them most. The first one is by the main garden, in the side yard. I also love how it works with the other decor I've acquired. This one is in the back garden, near the corn plot (aka squirrel food), zucchini, cucumbers, blueberries, quinoa, some pumpkins, apple and cherry trees, potatoes, edamame, and raspberries. See how I might like some tools over there? 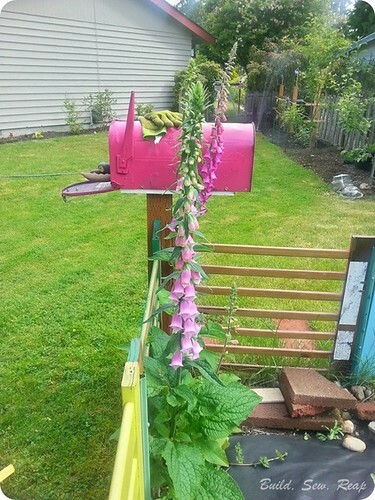 It was just a coincidence that this awesome volunteer Foxglove was the same color as the mailbox. I painted the box before the flowers emerged.